Easter Baking - Bunny Bums! It's that time of year again where adults are panic buying Easter eggs and trying with vain not to eat any when a chocolate craving appears t's when children of younger ages are being told about the Easter bunny, preparing for a break away from school, and looking forward to enjoying lots of chocolate treats when shop window displays are filled with cute chicks and bunnies, plastered with chocolate and decorational eggs. It's a time when families come together to celebrate, for religious, or seasonable reasons, where parents get to spend extra time with their children, and don't have to rush out of the door for school runs hen we are grateful we got eggs when we did, because we all know someone who complains about every supermarket running out of eggs, a time when we get to bake, make and create, just like I have with Dr. Oetker this past weekend. 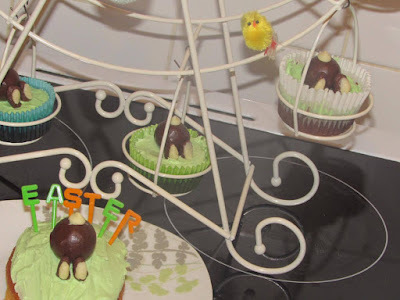 Receiving a bundle full or baking related products, I was given the challenge of recreating a recipe they've created for Easter. The recipe is for cute Bunny Bums cupcakes - something Spud found hilarious, and something we both found rather cute, and unique. I was tasked with the challenge of hacking the recipe just a little, to put my own twist on it! I thought about adding carrots, because bunnies and carrots go together bread and butter, but that wasn't what I ended up with as I forgot to get the ingredients I needed to make fondant carrots, mainly on purpose because I remembered the time I made Spud a birthday cake, and how awfully wrong it very nearly went! Dr. Oetker Muffin Cases (x12 cases). 125g Margarine (4½ oz of baking margarine, softened). 125g Caster Sugar (4½ oz). 125g Plain Flour (4½ oz). Dr. Oetker Fine Dark Cocoa Powder (x1 sachet or 25g/1oz). Dr. Oetker Baking Powder Sachets (x2 sachets/10g or 1oz). 200g Dr. Oetker Fine Cooks' Milk Chocolate (7oz). 15g Dr. Oetker White Chocolate Chips (1/2oz). 130g Dr. Oetker Liquid Glucose. 125g unsalted butter (4½ oz, softened). 2½ ml Dr. Oetker Madagascan Vanilla Extract (½ tsp). x1 tube Dr. Oetker Lime Green Gel Food Colour. 1. Preheat the oven to 180°C (160°C fan assisted oven, 350°F, gas mark 4) and put the muffin cases into 12 muffin tins. 2. Put margarine in a mixing bowl, add the caster sugar and eggs, then sift the flour, baking powder and cocoa powder on top. 3. Using an electric whisk on a low speed, gently blend the ingredients together. Increase the mixer speed/whisk for a few more seconds until well mixed. 4. Divide the mixture equally between the cases and smooth over the tops, bake for around 25 minutes until risen, and just firm to the touch. 1. Break up the milk chocolate, and place in a heatproof bowl over a saucepan of barely simmering water, then leave to melt. 2. Remove the water and stir in 125g (4½ oz) liquid glucose to form a thick paste, scrape the paste onto a piece of baking parchment and leave to cool. The mixture will become firm and pliable when cold, however avoid prolonged chilling as the paste will become too hard to mould. 3. Set aside 12 white chocolate chips, and put the rest of the chips into a small heatproof bowl, then melt as above (#2). Mix in 5g (1tsp) of liquid glucose, and leave to cool as above. 4. Put the butter into a bowl, and beat until smooth and glossy, gradually sift and beat in all of the icing sugar until creamy and soft, then add vanilla extract in. Then, mix in the whole tube of green gel food colour, and thickly spread the icing on top of each cupcake, right to the edge. 5. Divide the milk chocolate paste into 13 equal pieces, and form 12 portions into balls. 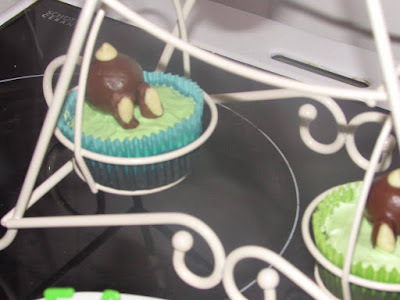 Place a ball on top of each iced cake, and use the remaining portion of paste to make 12 pairs of bunny feet, then leave aside on baking parchment. 6. Divide the white chocolate paste into 12 equal portions. Use these to make 12 pairs of foot pads and press gently onto the feet you've set aside. 7. Score bunny toes using a small knife, then gently press onto the sides of the bunny bodies. 8. 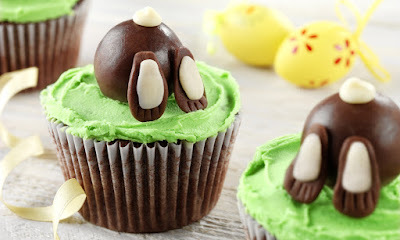 Top each bunny with one of the reserved white chocolate chips as a tail - your cupcakes are now ready to serve and enjoy! NOTE: If the moulding paste becomes too hard to work with, you can pop it in the microwave for 5-10 seconds to soften it up again! I followed nearly all of the steps above, but when it to step two of the baking method, just before adding the cocoa powder, I split the mixture into two bowls. In one of the bowls, I added the cocoa powder, and in the other I left it as it was, before following the next steps, meaning I was about to bake normal sponge, and chocolate sponge cupcakes! I also greased a cake tray, and placed a Easter egg shaped cookie cutter into the middle of it, before adding my mixture into the cutter and popping it into the oven to make an Easter egg shaped sponge cake. I then decorated the cake just as I did the cupcakes. 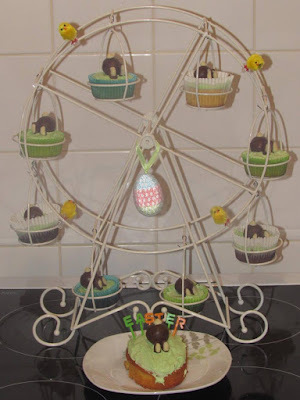 I debated on whether to use my lovely new ferris wheel cupcake holder that I received for Mother's Day, but when I realised the London Eye is only two miles away from London's Potter Fields, where Dr. Oetker commissioned a giant, seven foot edible Bunny Bum I decided to go for it! 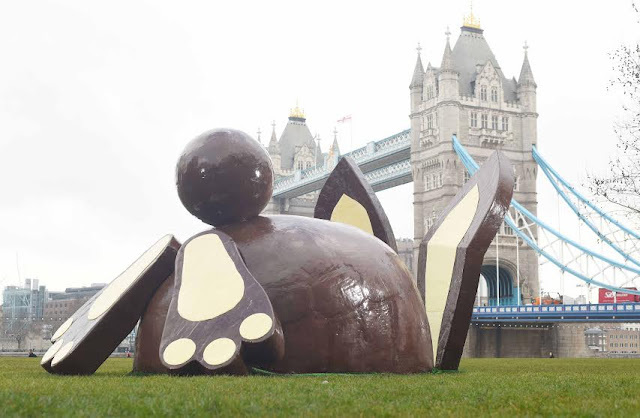 The giant Bunny Bum was created by using over 3,000 bars of Dr. Oetker Fine Cooks' Chocolate and crafted by baking expert Juliet Sear which took over 110 hours. For all chocolate lovers who didn't or couldn't make it to Potter Fields, you can replicate the edible Bunny Bum in miniature form, with the help of Dr. Oetker's website. 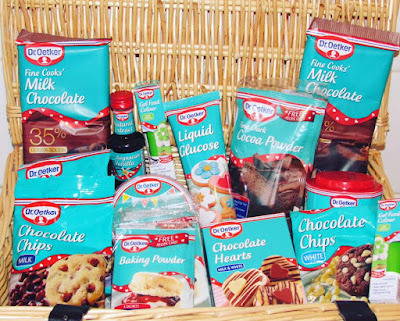 Let me know in the comments below if you got to see the Bunny Bum or tweet to Dr. Oetker on their handle @DrOetkerBakes using the hashtag #BunnyBum. To watch the video of the #BunnyBum in the making, press play below! Tips For Healthy Glowing Skin. Six Things Your New Pony Needs! My Five Picks On Easter Family Movies! The Rules of Dropping Food! Trying To Be Creative - Tree Inspired Flapjack! 5 Ideas to Get a Chic Nursery Room! Our Dream Holiday to Niagara Falls! Is It Time You Took Out Life Insurance?